Our clients tell us how they feel ... now they want to tell you. After doing some online research I decided to contact Sin On Skin Tattoo to have a Tattoo done of my car on my arm. 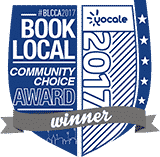 My decision was based on this being a top rated shop for a couple of years in a row and the fact they advertised their artist had taken blood pathogen training and the online portfolio posted. I contacted the shop by e mail and received a quick reply. I attended for consultation and spoke with Eldrick and Nicole. Eldrick was on same page with design and style as I had in mine, supplied numerous photos to work with. I returned for my appointment Eldrick was prepared had a design ready I was pleased with. I had the work done and was very pleased with the fine detail that Eldrick was able to incorporate into the tattoo and the attention to detail in the design. I would recommend Eldrick to anyone looking for fine detail work especially with cars. I am very pleased the total result and overall experience with this, Eldrick, and the shop overall. Kyle & Nicole are the most wonderful people to get a Tattoo from. My experience yesterday was absolutely fantastic and I am so pleased with the Artistry and expertise. I have been to another shop and there is no comparison to the super clean and most welcoming genuine people at Sin On Skin. Kyle & Nicole you are the best. Thank You so much for everything and the time spent as well as the quality is beyond words. AMAZING! The artists at Sin on Skin are all fantastic. I've had tattoos from both Kyle and Lacey and couldn't be happier with them. The shop is super clean and everyone is professional and makes you feel comfortable. Nicole is fantastic! She can answer all of your questions and steer you towards the artist who best matches what you're looking for. Plus she will make you feel right at home while you're waiting!! My mother and I were just here and we had the best experience possible. The staff are all so friendly, and their work is incredible. Would recommend to anyone and will be returning for sure! Also...I absolutely LOVE LOVE LOVE this new tattoo Eldrick did for me!!! I've gotten amazing compliments on it and I am just soooo in love with it!! I love all my tattoos but this is by far the BEST most amazing piece I have on my body to date! ❤️❤️❤️❤️❤️ People look at it and look at my ring and are like "wow! That's freaking amazing!! And the detail and oh my god that watch!!!" Lol I just had to tell yas again how awesome it is and how awesome y'all are!!!  Can't wait til the 14th!! 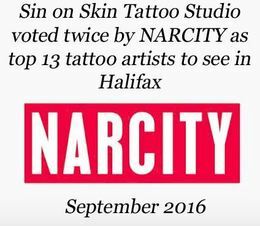 This is THE best tattoo studio in the city of Halifax. Clean, professional, and friendly. You want ink done by the best? Go here! You will NOT be disappointed. Nicole, I can’t even express how happy I am with my tattoo. On the way home I was looking at the picture again and tears came to my eyes - it’s more than I could have ever asked for. This tattoo means a lot to me, and my family and friends are already blown away by simply the picture, which doesn’t even do justice to the amount of detail in my piece. Between you and Kyle, I was treated with utmost respect and kindness throughout the entire process of getting this tattoo and I want to say thank you for that. You both made me feel at ease at Sin on Skin and made my experience top notch! Here’s the picture of my tattoo like you requested. I’m excited to go back in and finish it up. See you soon! I highly recommend getting work done here! :) thanks again! Love this place! So professional, beautiful tattooing, and everyone is so friendly I got my first two tattoos by Lacey and I'm in love with them. They definitely won't be the last ones I get! I've been meaning to write a note to pass on to Eldrick, could you please tell him how freaking awesome his work is!!! I absolutely love my paw prints on my back and the fact that it didn't really hurt just blows my mind!! I literally had no scabbing, only a little pealing one day but other than that it heeled perfectly. I have highly recommended Eldrick to some of my friends who want a tattoo and I know all future tattoos for me will be by Eldrick's hands...he's so awesome!!!! Thank you to you too for being so sweet and informative, you put me at ease as soon as I walked into the shop. Take care and have a great weekend. My 1st tattoo is dedicated to my Nan that passed away. Thank you so much Kyle, for the tattoo & the laughs!! Her hand looks just like the photo! Also, a thank you to Nicole who is always so helpful & welcoming! I can't wait to have my full sleeve. *Better picture, once it's healed! I want you all to know how great the staff make you feel from the first time you walk in the door just like coming home. The work on my tattoo is second to none Lacey did a fantastic job and the colors are very impressive if you even have the slightest thought of getting a tattoo Sin On Skin is the place to go . Thank you Nicole and Lacey you 2 are great to work with and the next tattoo is already being planned. I just had my second visit to Sin on Skin to complete my cover up. Kyle was my artist. This is the best place to go! Their shop is extremely clean and sterile. It is a very professional shop with the city`s best artists. Their staff made me comfortable and welcomed during both visits, before and after my tattoo. They were always friendly and informative. They went above and beyond to make sure I was happy with my tattoo and my experience. These guys are 5 stars for a reason. Super great people, sick tattoo work and just really wonderful service. Will definitely be coming back. Thanks again Eldrick & Nicole for today!!! Awesome awesome awesome :) Sin on Skin is my new and only place to go for tattoos now. Lacey was wonderful and Nicole was so welcoming :) Thank you thank you thank you! Hopefully see you again soon! If this shop were a student, it'd have a 4.0 GPA..
Not only is this shop kept clean and well-maintained (especially considering the lack of regulations when it comes to tattoo/piercing shops in Halifax), the staff are both knowledgeable and friendly. I have been going to kyle for a year now and have been consistently impressed by the sin on skin team. Trusting someone who has over 20 years of experience in the field isn't hard, and I've never been disappointed. Highly recommended!! I waited until I was 32 years old to get my very first tattoo. I was nervous and unsure of what to expect. I had gone to a different tattoo parlor originally for a consult and just got such a negative vibe it made me hesitant to try another but from the moment I walked in to Sin on Skin I was treated wonderfully and felt completely at ease. The shop is clean and professional, Nicole was friendly and so incredibly helpful. I chose Eldrick as my artist and he was amazing. My tattoo took almost 3 hours, and we only had to stop once for me to get my bearings but he was patient and understanding. He is easy to talk to and does fantastic work. I couldn't be happier with the final result or with the overall experience that I had at Sin on Skin. I would recommend it to anyone who is looking to get inked and if I decide to get another I wouldn't go anywhere else. The prices are reasonable as well - I was shocked that my tattoo cost so little when I had been quoted much more elsewhere. Thank you to all of you at Sin on Skin for making my first tattoo experience better than I could have imagined. This is my first tattoo and I couldn't have gotten any luckier. I was recommended to Lacey by a co-worker and she was beyond fantastic. I dropped off my design and we made our appointment for the next day. I was nervous all night about if I would like it but I showed up and it was exactly what I asked for. She even left some of the stenciling until I approved of it the next day. She was soft handed and quick but also did an amazing job. She has a great sense of humor and caters to her customer's every wish. I was so lucky to find her and you'd be lucky to have her as well. Nicole at the front desk could not be a better person to welcome everyone in, she made me feel comfortable and relaxed even though I was sweating bullets. I WILL be back! I got all mine there back when it was Skintastic and Kyle is amazing. In my lower back one there is bright blue and pink, and after almost 10 years it still looks awesome and bright. I will be back soon. It's the only place I trust. Consistently superb work as always!!! I look forward to many more tattoos and many years with you guys. Thanks Eldrick! Amazing tattoo! Amazing tattoo artist! Thank you so much Lacey! Phenomenal work! I made it!!!! Thanks for the great work Lacey! I saw Kyle at Sin on Skin for my most recent tattoo. The reception staff were friendly and helpful. Kyle was great. He immediately made me feel relaxed and at ease and the tattoo turned out AWESOME! Getting my tattoo from him was a great experience. I'll definitely return to Kyle at Sin on Skin for my future tattoos! Sin On Skin is great. Kyle did an arm piece for me in 2007 and it still looks as good as the day it was done!!! his attention to detail and line work is second to none. the shop is clean, friendly and priced well. HIGHLY recommend them to anyone looking for ink!!! Kyle has been a part of every piece of ink on my body, and I can''t say enough good things about his work. The color lasts longer than any other artist I have seen, the line work is amazing, and his creative approach is phenomenal. Every time I bring Kyle a picture the artwork he creates out of my original idea is 100 times better than the original. Sin on Skin is clean, friendly, and just an all around great shop. "Thanks again to Eldrick for what was the best first impression of getting tattooed possible! Worth the road trip from Toronto to Halifax! Loving the gorgeous ink and planning waaay too many more already :) Also thanks to the cheery new gal we met at the front desk for putting me at ease and making us feel right at home! " Just got my very first tattoo and he was so gentle.... answered all my questions...the best!!! The receptionist ( I forget your name sorry!) wicked customer service, you definitely went above and beyond!!! Planning on coming back very soon...I am addicted now!!! xoxo Thanks Guys!!! I have been going to Kyle for tattoo work since the late 90s back at the old Skintastic building. Sin on Skin is a professional, clean establishment with 2 of the best tattoo artists I have ever seen. Kyle's work is stunning and the colors truly last - I'm proof since my old ones always still stand out no matter how many new ones I get. Kyle is a creative genius who always takes my ideas and makes them much more awesome than they started out in my head! Best Tattoo Experience I went to Sin on Skin last month for the first time and was blown away by the friendliness by the staff. I was tattooed by Eldrick, he did a great job! He paid attention to detail, re-drew my original tattoo idea that I sent to him and made it even BETTER. Tattoo turned out perfect. It is my favorite tattoo on my body (and i have 9 others). Can't wait to go back and get my piece finished (shading) and get further work done! With two stunning and incredibly accurate portraits of the women who mean most to me; My Grandmother's, on my arm; I would have to say this is an absolutely fabulous shop, in so many ways. The staff - every single one of them are amazing, wonderful people. Friendly, would be an understatement. I feel like part of a family, every time i step foot through the door. They are personable and professional, and I could not think of a more appropriate environment. I rave about the shop, literally 5+ times a day(which is how many times I am complimented on the work they did), and will continue to do so, as well as be a loyal customer for as long as they are inking. Thank you Sin On Skin for making a tattoo experience, really an experience for me. As far as the review about only being able to do lettering...that person is out to lunch. Every where I go, people are amazed at the detail and colors used in my work. Everything in that shop is clean. All of the set up as far as needles go, is opened and placed while you wait in the chair. Every time I go into the shop, its like catching up with old friends. I never once felt out of place there. Nicole is such a sweet heart! And Kyle is hands down the best artist in Halifax! I wouldn't go anywhere else for tattoo work. They are MY tattoo shop for life. And remember the saying "good tattoos ain't cheap and cheap tattoos ain't good." I have been going to Sin on Skin to get tattoo work done for over ten years, and I'm constantly blown away by their talent and friendliness. I recommend the artists to all of my friends, and several of them have gotten very beautiful work there as well. My friend took her 18 year old daughter there for her 1st tattoo, she was that confident in their skill. They are fully equipped with all the sterilizing equipment necessary to run a clean shop, all needles are machine parts are autoclaved and opened in front of me, and all needles are disposed of in a sharps container as medical waste. Their artistry is second to none--they do not have any flash on the walls. Instead they concentrate on amazing custom work. I have not found anything that they can't do and do well. I have gotten black & grey there and color, they do amazing coverups and touch ups, and I have always been treated like a member of the family when I go there. I appreciate their high standards and ethics as well. They do not tattoo minors, and have stood by that for years. "This is my favorite tattoo shop, and one I will keep frequenting." I've been going to SOS for nearly 8 years now and over 70+ hours getting my work done with Kyle LeBlanc . I chose Kyle because he had worked with a previous artist whom is internationally known and recognized for his insane artwork. One thing I can say about SoS work is the quality is unlike any other tattoo shop in the Atlantic provinces. I have had hundreds of people talk to me about my tattoo (sleeve) in the last 8 years who have complimented me on the incredible detail and uncanny work that they have seen. I have yet to see a tattoo in the city or other cities that have come close to the level of detail and longevity that my tattoo has. "Simply put, I would never go to any other tattoo shop in Canada. Feel free to contact me for questions." Sin On Skin is fantastic. The staff are knowledgeable, very clean, and immensely talented. Kyle Leblanc is one of the best tattoo artists in Atlantic Canada. I am a member of Law Enforcement in the great province of Nova Scotia. The staff at Sin on Skin are nothing but the best people there is around. I have been going to SOS for the past 10 years as I was informed by one of the best tattoo artist walking that Kyle was the man to see. Mr. Long was not joking........ He truly is. Along with Eldrick, I would not want to send anyone else to another shop. Then at the helm is Nicole. You could not ask for a more friendly person to help ease you into the "pleasure pain" you may feel from your tattoo. She is always there to help you and go above and beyond. With the great combo of all of these members they ensure that all of their clients receive a clean, relaxed, professional experience. I have also had these wonderful people help me out with my charity work. Along with SOS I have raised over $31,000.00 and sent three families to Walt Disney World with the Make a Wish Foundation. Look under their charity section and see how big hearted they all are as well.They have all helped me make wishes and dreams come true, and done it so well that Mr. Darrell Dexter gave them thanks for all there great work !!! To all the staff at Sin on Skin, You ALL HELP BUILD BETTER COMMUNITIES!!! Thank you for all you have done, and all you will help do!!! Thank you Nicole, Kyle, and Eldrick for all you have done !!! I have 3 very large and elaborate tattoos done by Eldrick Murphy They are beautiful and custom designed for me. I have seen the pictures of the work done by both artists and they do amazing work. I must say when looking at some other local shops I was impressed with the cleanliness of the place. The receptionist is always very helpful and my artist is as well. I will take my grandchildren for their first tattoo to this shop! If you're looking for professionalism, great artists and a shop that is conscientious about the inks they use - this is the shop! I never have to worry about cleanliness and know that I'll get more than I wanted! Been going to this place for 9 years and get inked multiple times each year. I actually started bringing my family here for ink too: my sister, brother, and my father gets a matching tattoo with my brother this week! Great location too as its right downtown! I saw Kyle at Sin on Skin for my most recent tattoo. The reception staff were friendly and helpful. Kyle was great. He immediately made me feel relaxed and at ease and the tattoo turned out AWESOME! Getting my tattoo from him was a great experience. I’ll definitely return to Kyle at Sin on Skin for my future tattoos! Amazing! Kyle is the most amazing artist I've found in Nova Scotia. I love his work, and he's always given me amazing deals. If you're serious about getting a great tattoo that won't have to be fixed or covered up later then this is definitely the place to go. Scott, the piercer is wicked as well. Great work and great deals. Everyone is extremely knowledgeable and friendly. My favorite shop in Canada.